Well nothing new in Gov. 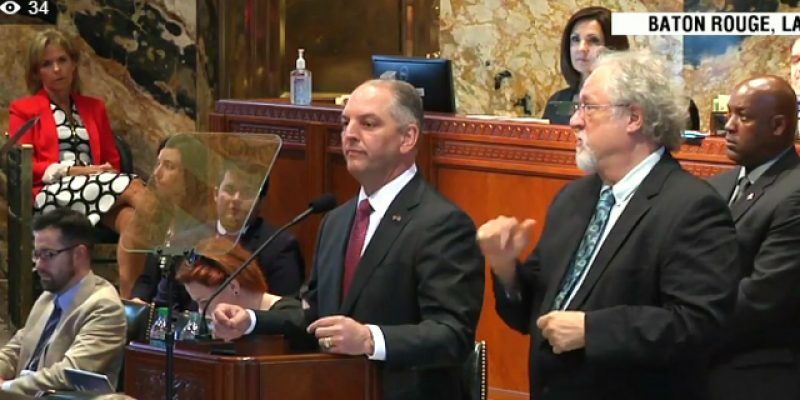 John Bel Edwards’ speech yesterday to open this, the fourth legislative session of 2018. I thought perhaps that after so many failed special sessions Edwards may have given some indication that he might be willing to work with legislators on their goals, but I guess not. It was the same talking points; the people are depending on us (translation – let’s raise more taxes) and only a small group of politically motivated legislators are blocking us (translation – he can’t sell his ideas to either the Republican majority or the Black Caucus). So, let me try again to put this into the perspective that has been presented by the state’s economists. We suffer under a budget shortfall because our state’s economy has not recovered from the double whammy of the Obama years of national economic lethargy added to a major decline in oil and gas production. It was these same two economic factors plus the end of the Katrina windfall that plagued the Jindal years. Jindal’s approach to these problems was to cut taxes, reduce government spending, privatize major segments of government services, and spending one-time funds that government departments had saved up over the years. Jindal’s failing was not reforming our fiscal structure by aligning spending with revenue and the use of one-time money to fund continuing expenses instead of tackling serious policy reform. In response to economic decline our current governor’s approach has been to grow government, raise taxes, and blame Jindal for all our troubles! You can draw your own conclusions, but in the face of years of sub-par economic performance our state’s budget has been increased about $5 billion from Jindal’s last budget year to last year and our future projections of autonomous spending growth will be hundreds of millions of dollars per year going forward. So, there it is, as we face yet another special session in a state whose economy is weak at best we were told that we simply must raise taxes and that it’s a small number of politically motivated malcontents that are blocking our obvious agreement to do so. The truth is that there are valid reasons that there are legislators who do not support Edwards’ spending growth and tax increases. These legislators implicitly understand that the only thing we must grow is our economy. And they know that the path presented by the governor, no reform of government, no alignment of revenue to expenses, and an emphasis upon massive social spending over important state priorities will lead us in the exact opposite direction from that in which we should be embarked on. So, let me make this clear. John Bel Edwards is right, the opponents to his plans are politically motivated. But unlike what the press would have us believe and unlike what the governor apparently defines as political opposition, legislators from all over the spectrum are not opposing him just for the politician that he is. They are instead opposing his vision, or lack thereof, as they are motivated by their own vision of a Louisiana that could be among the greatest states in the nation. They are not inspired to follow him down a path that has been the same as our forefathers followed. So, I suppose I will not be surprised if this session ends like all the rest. Based upon the governor’s speech there is nothing new or different in his approach and so I would expect little change in the legislature’s reaction to it. One day it will be truly exciting to hear a governor present a plan for Louisiana that will take us where we have never been before; a place where personal well being through a strong economy is the goal. A plan that doesn’t inspire disparate divisions, but that everyone can coalesce behind. Next Article So What Are The Dimensions Of The Current Budget Fight At The Louisiana Capitol?